Recent ly media attention has brought the seriousness of concussion to the forefront of public eye. The subject of concisions and the long and short term effects is a concern at every level of play; from grammar school, high school, college and even pro sports. In the past, “getting your Bell Rung” was not considered a setback. A broken or dislocated bone can be quite obvious and in most cases a player physically cannot return to play however, a concussed athlete may physically be able to return to play without any pain. You can’t see a concussion. WHAT IS A CONCUSSION? A concussion is an injury to the brain caused by impact. Even a mild blow can cause a concussion. A player does not necessarily have to be knocked unconscious to cause a severe concussion. It may be the manner in which an athlete is hit which can cause the injury. Side impact hits, impact under the chin or to the jaw, can be the most vulnerable areas. Computerized concussion testing can be administered and are extremely helpful diagnosing and assessing return to play readiness. 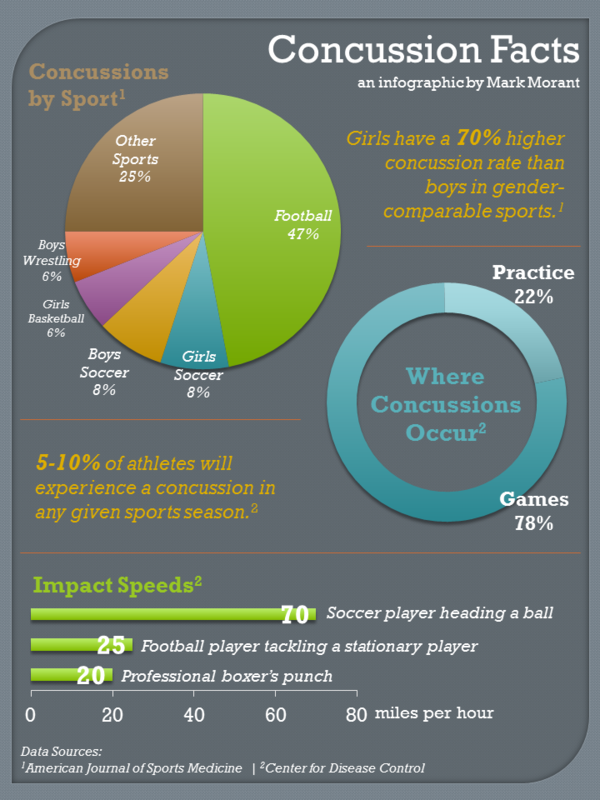 The tests are administered to each athlete before a concussion occurs. Memory, reaction time, brain processing speed, balance and postural stability are tested post injury, another test administered at the time of injury. The results are then compared to measure the athlete’s brain function. This helps improve concussion care and make return-to-play assessment. Recent research has shown that a custom made mouth guard fitted by your child’s dentist might significantly reduce the risk of concussion. Parents and coaches should inspect mouth pieces regularly throughout the season for wear and tear. In addition to the mouth piece, it is extremely important that your child’s chin strap is adjusted properly, sized correctly and each helmet is certified and reconditioned every year. Your pediatrician should be able to help you check your child’s helmet for a proper fit. Return to play guidelines may vary, but all agree that an athlete should be symptom free at a minimum before returning to play. Slowly increase non-contact physical activity when symptom free. Return to contact sports recommendations rage for 7-10 days after the first day you are you are completely symptom free or have returned to baseline. When in doubt, check with your pediatrician. Second Impact Syndrome is when a player sustains an additional concussion or brain trauma before recovering from the initial head injury. Second impact syndrome is extremely serious; it can be fatal or cause permanent brain damage. Second impact can increase brain swelling and increased intracranial pressure, when this occurs it may be difficult or impossible to control. Follow the Return to Play Guidelines to limit the risk of Second Impact Syndrome.